CHANDIGARH, Sept 26  The two automobile-mechanics, who had robbed a resident of his valuables, landed in police custody after an hour-long chase by cops which started in Sector 33 and ended in Sector 39 late last night. CHANDIGARH, Sept 26  The postgraduate defence studies course in Panjab University has received a blow with the Syndicate's approval for a new Centre for Security Studies. 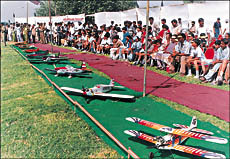 PANCHKULA, Sept 26  The Haryana Tourism Department came through with flying colours during an aero-modelling display programme organised as part of the silver jubilee celebrations of the department at the Cricket Stadium in Sector 5 here today. CHANDIGARH, Sept 26  A unique project, "Sunday School'', was inaugurated at Government High School, Sector 40-A, today by the District Education Officer, Mr Brahmjit Kalia. 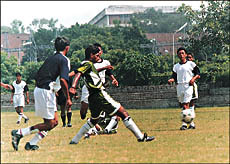 CHANDIGARH, Sept 26  Eleven teachers from Punjab, Haryana, Himachal Pradesh, Delhi and Chandigarh were presented awards for their outstanding performance and voluntary services in the field of creative education, at a function organised by "The Educationist", a social organisation, here today. PANCHKULA, Sept 26  For the calorie conscious, it is time for a feast with the North India Institute of Hotel Management here having drawn up a low calorie diet in consultation with experts from a local health club and beauty parlour for a week-long carnival beginning today. CHANDIGARH, Sept 26  The Market Welfare Association of Sector 47-C has complained of lack of basic amenities in the market. CHANDIGARH, Sept 26  Experts and AIDS control programme directors of Punjab and Haryana today expressed concern at the rising number of HIV-infected persons and stressed the need for administrative and financial decentralisation with a view to combat the menace. CHANDIGARH, Sept 26  In the current competitive environment, when the world is shrinking to a global village and when the traditional methods of employment, especially in the hospitality industry, are yielding place to more professional and sophisticated ways of training, there is need to look for more dynamic and innovative ways to meet the challenges of human resource development in the next millennium. CHANDIGARH, Sept 26  The Central Scientific Instruments Organisation, Sector 30, celebrated the foundation day of the CSIR today by organising an open house for the general public. RANI MAJRA (Kharar), Sept 26  resentment prevails among residents of Rani Majra, Salampatpur, Teor and other villages in the absence of any bus service to these places. CHANDIGARH, Sept 26  Maintenance of law and order to ensure proper academic environment, better facilities for students in the campus and hostels, easy availability of student leaders and establishment of a dean placement cell are among the main demands of most varsity students. CHANDIGARH, Sept 26  A group of leading senior Sikh citizens, who met here today, want that the initiative taken in proposing amendments to the Sikh Gurdwara Act and the draft All-India Gurdwara Bill should not be frittered away in needless controversies.